Norwegian Cruise Line Hawaii is the only line that offers 7-day sailings to all 4 Hawaiian Islands year round, all aboard the glorious Pride of America. All trips are roundtrip Cruises from Honolulu and feature stops in Maui, Hilo, Kona and Kauai which is Hawaiian Island hopping at its best. From the Garden Island to the Big Island and beyond, Hawaii offers such diverse experiences for cruisers from breathtaking shore excursions to surfing, sightseeing or relaxing on the beach. For variety and unrivalled beauty, Hawaii is the place to be. 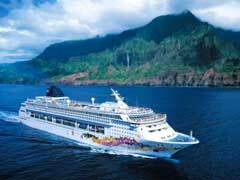 The Pride of America cruise Hawaii offers a ship that celebrates the United States in true Norwegian fashion. There is the soaring Capitol Atrium, Little Italy for that one-of-a-kind (at sea) New York Italian dining experience, the Napa Wine Bar and Waikiki Bar for extra variety, and many balcony cabins that are perfect for whale watching. Norwegian Cruise Line Hawaii has thought of it all in celebrating all that Hawaii is famous for in one packaged trip while giving a nod to the United States in the theme of the ship. These 7 days are a patriotic parade through the lovely island archipelago that we know as the state of Hawaii. The things to do in Hawaii are as varied as the islands themselves, with plenty of water activities like snorkelling, surfing and deep sea fishing, as well as many tourist destinations, places of interest and natural beauty. You can swim with and feed rays, swim with dolphins or go on whale watching tours. You can tour volcanoes, on foot or on a bike, marvel at the black sand beaches, explore caves, plantations and historical sites which will all leave you with memories galore as you hop from island to island during your week long adventure. Norwegian Cruise Line Hawaii offers cheaper fares among its many departure dates which are sprinkled throughout their schedule, with their regular prices starting at $1099pp. Depending on your cabin choice, some Hawaii cruise deals will include on-board credits or a bottle of wine (or both) on selected sailings if you book a certain amount of time in advance of your sailing date. Past passengers, those in various Norwegian clubs or members of the military may also see cheaper prices on some sailings. For sailing around Hawaii no matter what part of the year it is, nothing beats Norwegian Cruise Line Hawaii and its Pride of America ship.